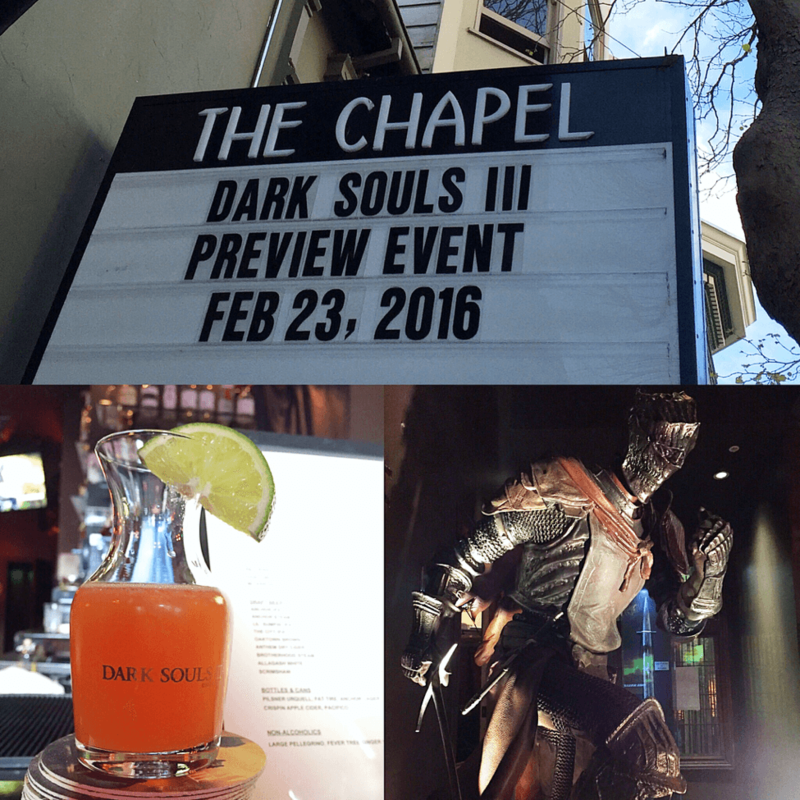 February 23rd 2016 – San Francisco’s The Chapel, located in the heart of the Mission district, was ground zero for Bandai Namco’s preview event featuring the highly anticipated Dark Souls III. The venue, historically, acted as a mortuary in 1914 and has since been renovated into a hotspot for live music, restaurant, and a popular local tavern. 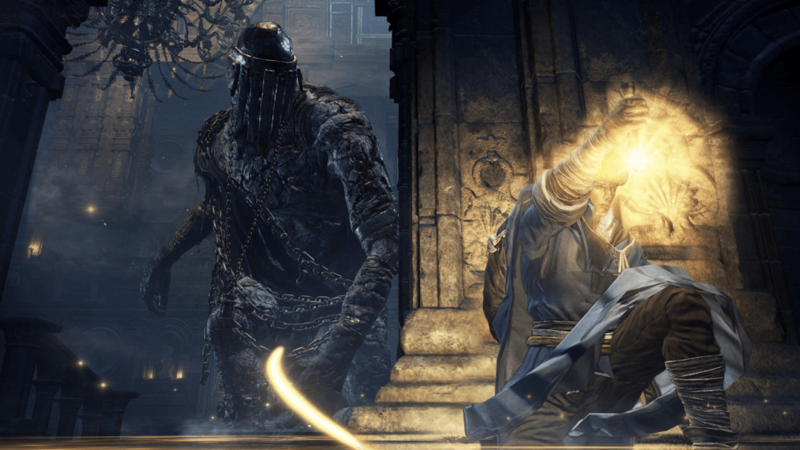 Within, the press junkies and famed Soul players alike all enjoyed drinks, a night of chilling surprises, a couple cool announcements from the publishers, and finally: a lengthy hands-on demo with Dark Souls III. Go on and touch her darkness – you’ll like it. After downing some Estus Elixirs, mingling with other Souls survivors, and trying out a new Soul-inspired game called Slashy Souls, we made our way to the main hall featuring a 40 foot arched ceiling fully decorated in Dark Souls imagery. 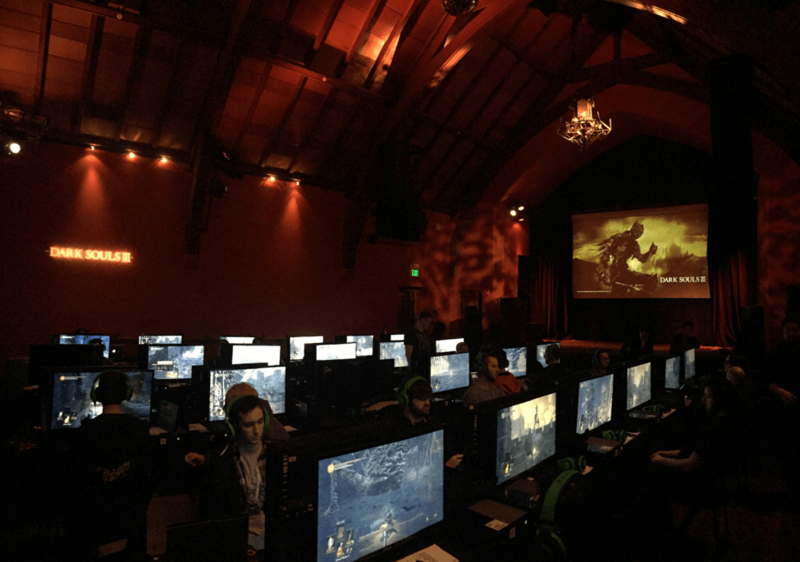 At the front, a life size model of the Red Knight and a recreation of Artorias’s Greatsword ominously guarded the multiple rows of gaming stations. After a couple of announcements, Bandai Namco debuted a new trailer showcasing the horror that awaits players with awesome visuals and haunting vocals, available to watch here. The demo we played was running on Xbox One and each station was equipped with a different character class. I ended up with a warrior class for my journey through the two new areas and the Wall of Lodeleth, which many of you will have probably seen from previous trailers and network tests. 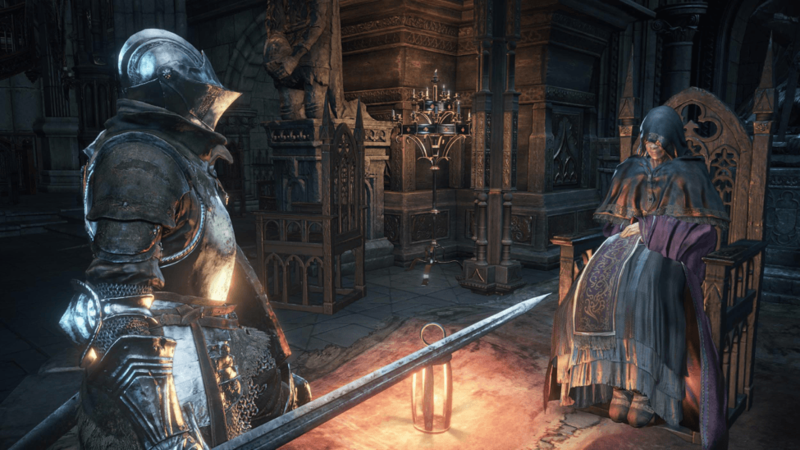 The current state of gameplay in Dark Souls III parallels the most recent Bloodborne DLC, the Old Hunter. 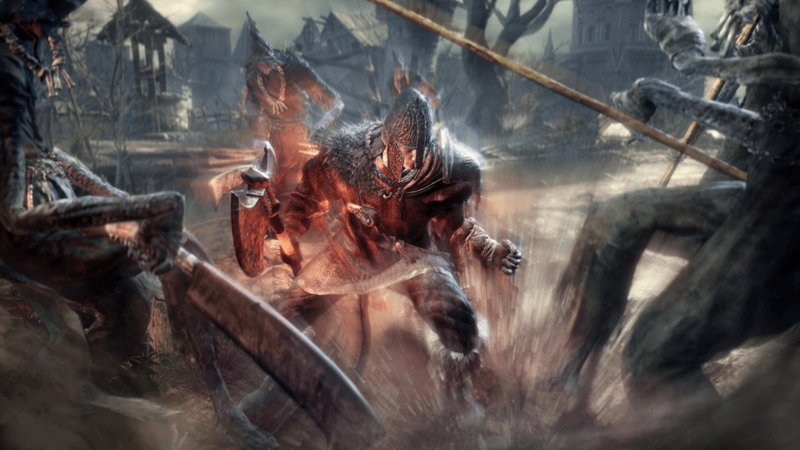 In The Old Hunter, players were rewarded for highly aggressive playstyles and shields, ironically, left players vulnerable to attacks because they were heavy and slow. 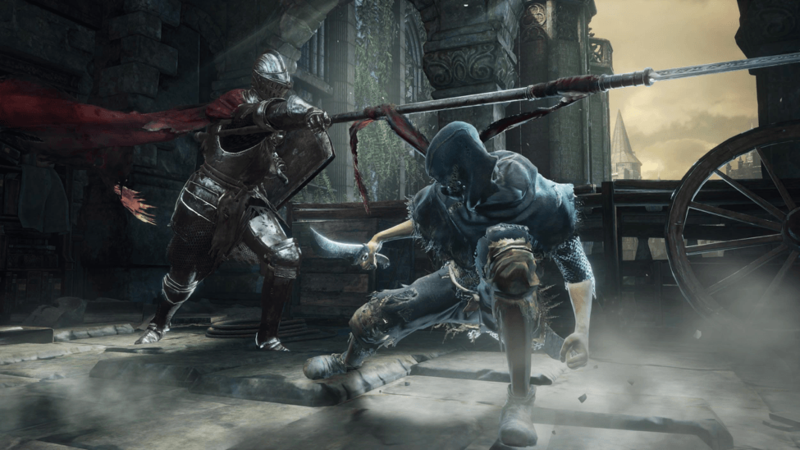 Likewise, Dark Souls III has you focusing more on rolling tactics and up-close staredowns with enemies – the dodging and parry setups will remain at the fundamental core of combat as as result. The demo featured four locations, and three (probably all four) of which were taken from the very beginning of the game. Each area was chalk full of content, both familiar and new, and most featured large areas, interesting enemies, and gorgeous vistas. 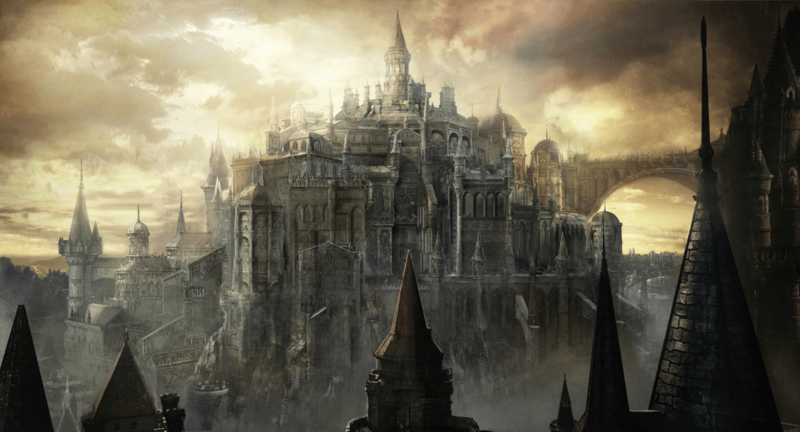 For the Demons Souls player there’s the occasional reference or nod, but more importantly, returning characters and the familiar Fire Link Shrine were very welcome and heart-warming. From what I’ve experienced, the new Weapon Art amps up the combat system and adds a new level of depth to how to attack enemies and how to defend yourself. Weapon arts, depending on the weapon being used, help heighten your damage output, give you different movesets, or enable you to soak up damage better. We can’t wait to see what PVP looks like with so many different abilities at the disposal of players. Players now have the option to allot their Estus between health and/or magic replenishing pools. The ability to go all-in on magic restoration somewhat a game changer, but we’re sure most players will dump all their Estus into heath replenishment instead. The new enemies come in all shapes and sizes, and are often mixed together in different groupings around an area. 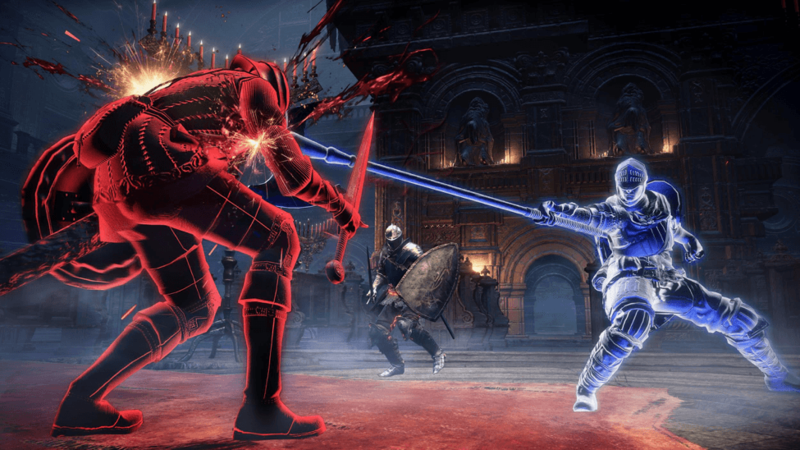 This gives another level of depth in combat and challenge, where players will have to deal with multiple types of enemies with unique fighting styles. Sprinting is still a very viable strategy for evading groups of enemies, but take note where you want to go because you can easily end up at a dead end and become quickly surrounded with the upped enemy count and variety. The boss fights have vastly improved. Both the bosses and their environments now transform as the fight progress. Players will have to deal with new movesets and adapt to their surroundings quickly to stay alive. One of the bosses in the demo was originally fought in an open field, but as the boss progressed down to half health the arena shrank and the fight became an close-up affair. Somewhat a failing, these bosses will probably only show up once so you’ll need to start a new game to experience each one again. Everything was wickedly detailed with awe-inspiring backdrops. 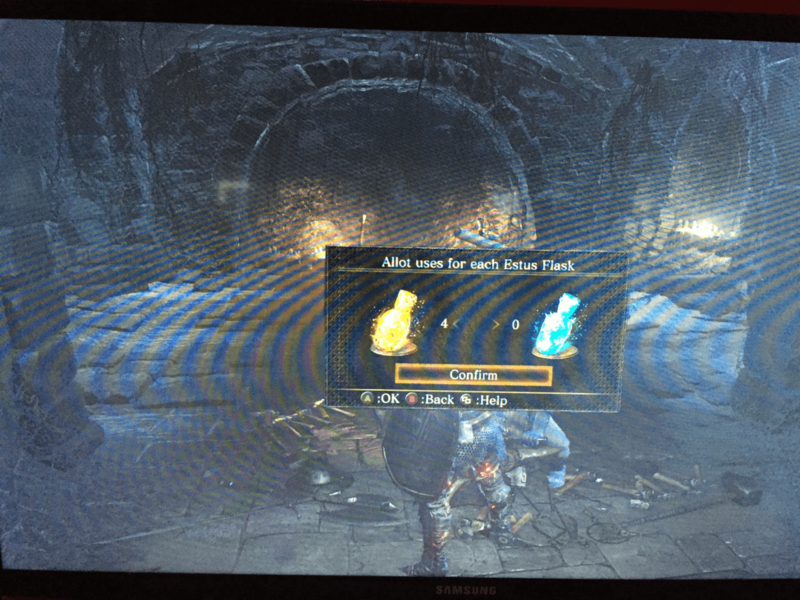 The graphical quality is probably the biggest jump between any of the Souls entries. Running on the same engine as Bloodborne, there were moments that I thought I was back in Yharnam with wandering dogs and Hunter like-enemies. Besides some frame drops in the third area and a very rare bug that only my station experienced, there were no noticeable defects. It feels like every corner of the game was meticulous and painstakingly fleshed out such that players will endlessly search and find beautiful sights and secret story elements hidden away. Returning to form, the areas feel massive and classically mad architectural maze-like designs return to disorient overeager players. By the time I had reached the third area and have scaled to the highest tower, I can see the previous path over the course of two levels to get there – truly a sight to behold. The landscape reminded me of Avatar or Skyrim, where everything is very vertical; if you see it, you can probably go there. The level design is so intricate where it is easy to lose one’s bearings and at the same time be delighted to discover new areas and hidden paths. We didn’t partake in any of the PvP experiences as we were too busy with the solo-stations, however, staged invasions are back so you can’t ever truly escape PvP. 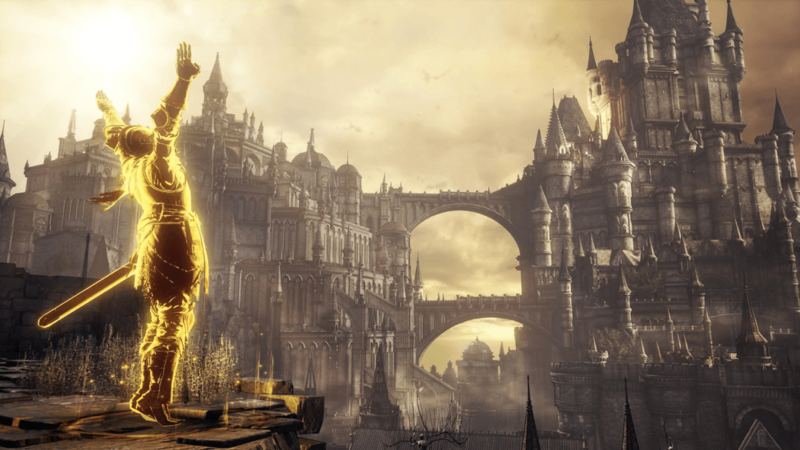 It is truly amazing how quickly Fromsoft has been pumping out these games, especially with such a short time table between Bloodborne and Dark Souls III, not to mention they are all top notch products. Mr. Miyazaki must have a pack with the actual Devil to create all these sinfully good games that leaves players wanting more and more. 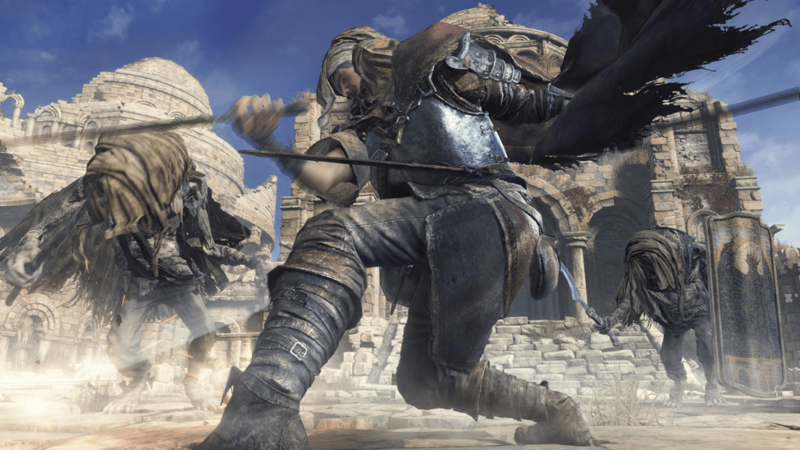 I have no doubt that Dark Souls III will be another incredibly brutal entry in the souls series and April cannot come sooner.